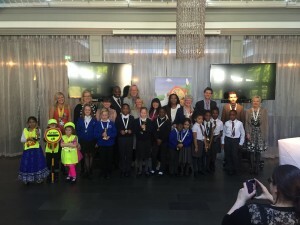 Pupils from five Midland primary schools are poised to become recording artists after their original songs and performances impressed rock legend Rick Wakeman in the finals of a song contest. The former Yes member judged the competition devised by Birmingham road safety charity DriveSafe & StaySafe and held at Hampton Manor, Solihull. Winners were Delves Infant School, Walsall with their rap song ‘It’s all about Road Safety’. The song contest accompanied the official launch of The Conies, a new DriveSafe & StaySafe video series for primary schools featuring a family of traffic cones who deliver road and personal safety messages through their comic adventures. The multimedia programme will also incorporate interactive games, teaching packs and other e-learning resources, developed with the help of pupils and teachers from Solihull Junior School and St Alphege Junior School in Solihull. West Midlands Deputy Police and Crime Commissioner Yvonne Mosquito, who gave the keynote speech in support of the initiative, said: “Past Government campaigns to engage with young people through Tufty the Squirrel and the Green Cross Code Man did a lot of good work, but there are still a shockingly high number of children involved in road accidents each year. Fay Goodman, Managing Director of DriveSafe & StaySafe, said: “My vision is for our little Conies to keep children of all ages safe by engaging with them in their fun cone-shaped world where road signs come to life. Save Kids’ Lives: Trailer of Luc Besson’s Road Safety Film – Video	DriveSafe & StaySafe Road Safety Song Competition – watch the video!